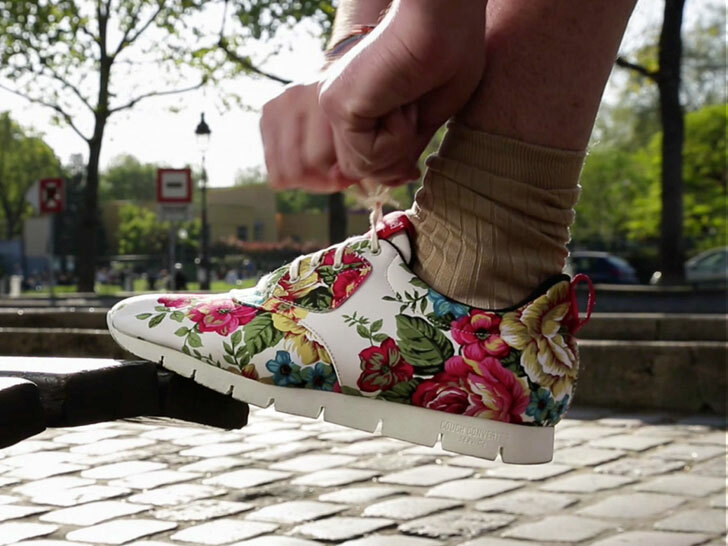 Vittel bottled water company wants Europeans to get off their couch and get moving and to do that, they’ll turn your old couch into a new pair of custom running shoes. The French lifestyle brand thinks moving is far more important that tuning into your TV and a shoes inspired by your couch could be just the ticket to get you off of it. Simply send in a picture of your couch to Vittel Couch Converter along with a swatch of your couch’s fabric and Vittel will make and send you a pair of couch upholstered athletic shoes. Vittel estimates that Europeans on average spend about 4,5 hours sitting on their couch. The active lifestyle brand just couldn’t stomach it, so they tried to inspire people to get off their couches with the Couch Converter. Players of the game sent in pictures of their couch along with a swatch of fabric from it. Then shoe designers took that image and swatch to design a bespoke, handmade shoe. Whether the couch was floral, plaid, woven, ugly, cute, sophisticated or worn out, Vittel’s talented cobblers were up to the task. The Couch Converter gallery shows some pretty amazing results. Now if Vittel can just get people to get out and move rather than put their couch-wearing feet up on the coffee table while kicking back on their sofa. Vittel bottled water company wants Europeans to get off their couch and get moving and to do that, they'll turn your old couch into a new pair of custom running shoes. The French lifestyle brand thinks moving is far more important that tuning into your TV and a shoes inspired by your couch could be just the ticket to get you off of it. Simply send in a picture of your couch to Vittel Couch Converter along with a swatch of your couch's fabric and Vittel will make and send you a pair of couch upholstered athletic shoes.